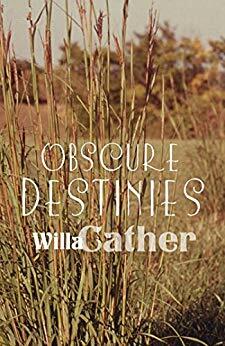 Obscure Destinies is a collection of three longish stories by Willa Cather. They are all character studies of people living in small prairie towns. I distinctly felt that the stories were based on people Cather knew during her days in Nebraska, even though one story is set in Colorado. “Neighbor Rosicky” is about a farmer, an old Czech man whose doctor tells him at the beginning of the story that he must stop all hard work. He has a heart condition. Rosicky has not prospered as well as some of his neighbors, but he is a kind man who enjoys life. He has an affectionate relationship with his family, but he is afraid that his oldest son, Rudolph, and Rudolph’s wife, Polly, will become discontented with the difficult life of farming and move away to the city. Rosicky has lived in London and New York and felt that he was never free until he owned his own land. “Old Mrs. Harris” is about a woman who lives with her daughter’s family. Mrs. Rosen, her neighbor, thinks she is mistreated. Her room is a passageway in the house, and any treats intended for Mrs. Harris are either resented or appropriated by her daughter, Mrs. Templeton. Mrs. Harris is from the South, where it was apparently commonplace to spoil young women, and where some older woman usually ran the household behind the scenes. But here she has no help besides a hired girl, and Mr. Templeton’s career has not been successful. Young Vicky has an opportunity for a scholarship, and she has been encouraged to study by the Rosens. But the Templetons see no reason why she should go to college. Only Mrs. Harris understands. “Two Friends” is about the friendship between two prominent businessmen in town, Mr. Dillon and Mr. Trueman. The narrator as a child loves playing at their feet each evening as they discuss Mr. Dillon’s tenant farmers, the history of the area, and other interesting topics. However, the friendship eventually founders over politics. These stories are interesting and insightful character sketches. “Neighbor Rosicky” even brought tears to my eyes. I believe I’ve enjoyed these stories more than I have some of Cather’s novels, which is unusual for me. I really like stories about ordinary people. And I like to imagine that they *are* based on people the author knows. It seemed like they probably were. It is said Neighbor Rosicky is based on Annie Sadilek Pavelka and her husband who inspired My Antonia. This just warms my heart so much. Cather stayed in regular contact with Annie her whole life. There are pictures of Annie’s house online. The home is being preserved. (Thank goodness) Old Mrs. Harris was based on Cather’s relationship with her grandmother. The well educated neighbors were based on her actual neighbors who lent her books to prepare her for university. I love the first two stories of Obscure Destinies. I imagine Cather had great joy writing them. I’m completely new to Willa Cather, these short stories sound like a good place to start. I love the idea that they’re based on people she knew! Yes, I’m thankful someone actually verified that.